Rise and shine for a warm croissant sandwich. Savory sliced ham and melty cheese come together on a buttery croissant for a perfect start to your day. 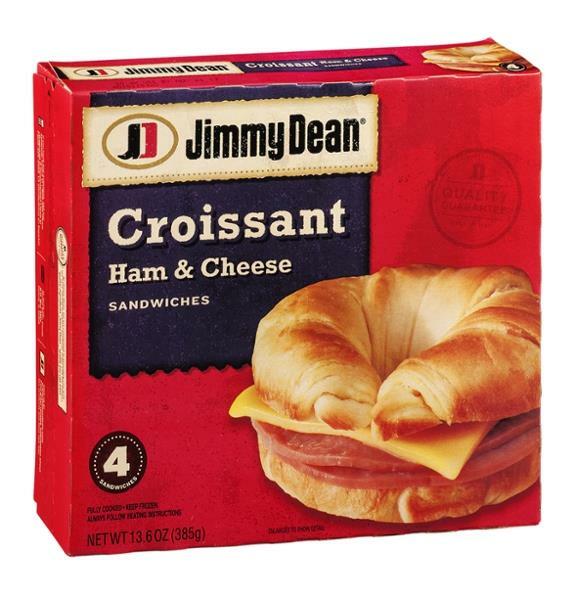 Packed with 11 grams of protein per serving, Jimmy Dean Ham & Cheese Croissant Sandwiches give you more fuel to power your morning. Simply microwave and serve for a delicious breakfast at home or on-the-go. Includes 4 individually wrapped sandwiches. Breakfast is a great deal like life. You get out of it what you put in. Jimmy Dean himself once said “wake up like a tight pair of pants ready to rip” and that good morning feeling can only be done with a good breakfast. To us today at Jimmy Dean Brand, the sun is always shining in the morning, and that always starts with focusing on quality and making the world a better place, one breakfast at a time. Croissant: Enriched Bleached Flour (Wheat Flour, Niacin, Reduced Iron, Thiamine Mononitrate, Riboflavin, Folic Acid), Water, Vegetable Oil (Palm, Soybean), High Fructose Corn Syrup, Yeast, Contains 2% Or Less: Soy Fiber, Eggs, Salt, Whey, Mono- And Diglycerides, Maltodextrin, Calcium Propionate And Potassium Sorbate (Preservatives), Sugar, Medium Chain Triglycerides, Natural And Artificial Flavor, Soy Lecithin. Smoked Ham Water Added, Smoke Flavoring Added: Ham, Cured With Water, Contains 2% Or Less: Modified Corn Starch, Salt, Sugar, Sodium Lactate, Potassium Lactate, Sodium Phosphate, Sodium Diacetate, Smoke Flavoring, Dextrose, Sodium Erythorbate, Sodium Nitrite, Flavorings. Pasteurized Process American Cheese: Milk, Water, Cheese Culture, Cream, Salt, Sodium Citrate, Potassium Citrate, Sodium Pyrophosphate, Sorbic Acid (Preservative), Sodium Phosphate, Citric Acid, Annatto (Color Added), Soy Lecithin, Enzymes.